I love death certificates. I sort of collect death certificates, well, at least for family history purposes. They’re a wealth of information – and some of it is good! Like all documents, the information contained on a death certificate is only as good as the informant. If the informant knows the correct dates, names or spellings, the document MAY be correct IF the document transcriber records it correctly. As I wrote in an earlier post, good genealogists are good skeptics. What can we learn about our ancestors from their death certificates? What is the most valuable information found in these documents? How should we approach them? What cautions should we consider? Consider the certificates of three brothers, three of my great grand uncles. William F. Ashlock died 12 October 1922 in Wise County, Texas. These facts and the cause of death are the most reliable facts on a death certificate. Why? Because they are the facts provided by an attending physician who is aware of the date, time and place of this event. This information is found on the right side of the three samples we see here. We look here at only the left side of these samples. 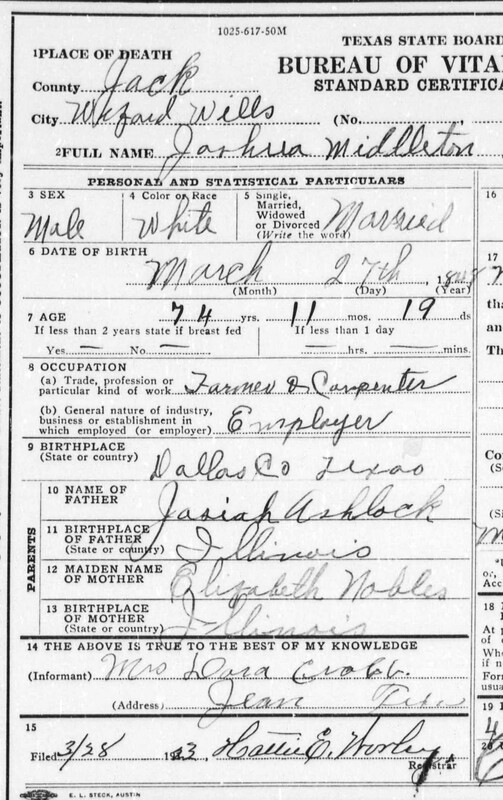 Joshua Middleton Ashlock died 17 March 1923 in Wizard Wells, Jack County, Texas. Place of death: Wizard Wells, Jack County, Texas. James Wesley Ashlock died July 23, 1936 in Wise County, Texas. Undertaker: O.L. Christian of Decatur, Texas. Josiah Ashlock was born in 1814 in Anderson County, Tennessee. He married my great, great grandmother Elizabeth Norman in Greene County Illinois in 1833. She was born in Kentucky. They began their family in 1834 with the birth of their daughter Nancy. Their oldest son William F. arrived in 1837 followed by two daughters and a son. They arrived in Texas in about 1844 as part of the Peters Colony and settled on land along both sides of the Denton and Dallas County lines. The original grant would be mostly north of the President George Bush Freeway east of where it intersects with with Stemmons Freeway (I – 35). 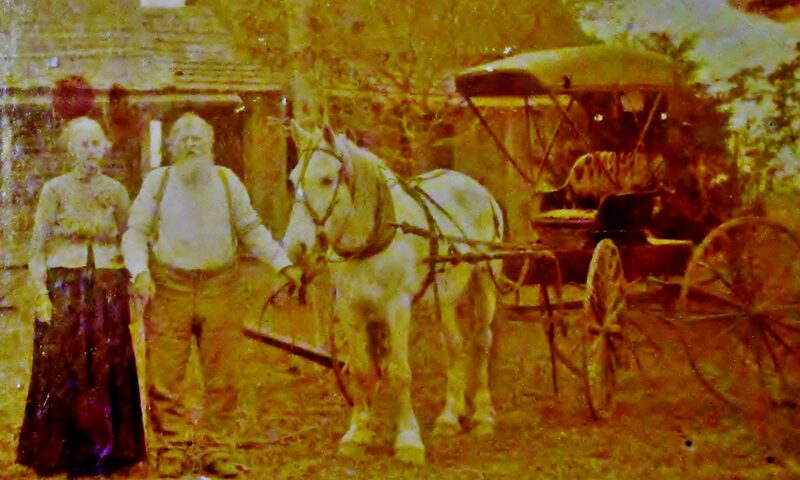 Joshua Middleton was the first of this Ashlock family to be born in Texas in 1849. His younger brother James Wesley was born in July of 1850 also in Dallas County. Josiah would die around 1852. Elizabeth Norman Ashlock married my great, great grandfather Stephen Riggs. He also had Peters Colony land surveyed in southeastern Denton County. His first wife had died sometime before 1850. My great grandmother Rachel Marinda Riggs would be born in Denton County in 1855. So how did our three death certificate informants do at the death of these three Ashlock brothers? The informant for William F. Ashlock was W. H. Ashlock. I’m not sure who he was. He may be a son or a grandson. He knows his family. He gets William’s birth date, birthplace, mother’s name and birthplace all correct. He names William’s dad as “Joe” Ashlock. While I can understand the 1820’s use of this name, I doubt I’ll ever find it in any official documents related to Josiah Ashlock. He missed the place of William’s father’s birth. All-in-all it’s not a bad performance. The informant for Joshua M. Ashlock was Dora Crabb. I’m not sure who she was. She gets Joshua’s name, place of birth, and father’s name correct. She misses by one year the correct birth date. She is also incorrect about Joshua’s father and mother’s birthplaces. She also gives the wrong maiden name for Elizabeth. This might confuse a well intended family historian. The informant for James Wesley was his son G.C. Ashlock (That’s Grover Cleveland). He’s right about his father’s birth date, birthplace and name. He gets his mother’s name correct. He doesn’t know his father or his mother’s birthplace and he doesn’t guess. He doesn’t know everything but he won’t confuse you with what he doesn’t know. What do we learn from these death certificate examples and how we can use death certificates in our genealogy research? Death certificates are very reliable for the date and cause of death. I will take this date of death over what is on a headstone or in a family bible. Why? Think about it. Use the comment section. If the date on a death index is different from a death certificate, I’ll give more weight to the certificate. The information on any document is only as good as the informant and as reliable as the transcriber. I like the information from an attending physician and treat everything else with less weight. What do we do with the other information on a death certificate? Use it to corroborate other information you have. Use it as clues on where to research next. I love death certificates and what they provide family researchers! I’m just a little skeptical and you should be as well. I treasure my death certificates, too. And you’re right about the reliability factor. I learned early about the difference between primary and secondary sources. Also, just like the “pass the secret” game — the more people a fact passes through, the greater the chance for error. Despite the fact that the informant may be overcome with grief, I’m inclined to think that spouses, children, and some siblings are the most reliable sources. This might be due to the fact that my family (parents, siblings, aunts and some cousins) remembers birthdays and places of birth so well. Yes, death certificates are a wellspring of information for the resourceful genealogist. I enjoyed reading your post. Are you by chance Doris Anderson? I am looking for her related to her Riggs family. I have an old emai that doesn’t work. Im J.M. Ashlock great great grandson Mark Ashlock I live in wise co. Thanks Mark! Look for my email in your email. Does anyone know who were the parents of Josiah (b. 1814)? That is what I am trying to figure out as well. I believe I am a direct descendent but I don’t have much info on the ashlocks. Have you had any luck? Abbie Ashlock is my great grandfather. There are a few theories out there, but we cannot find anything which truly states who the parents are (other than Internet posts) for James Middleton Ashlock (b. 1808). We do think that James and Jesse Richardson Ashlock (b. 1800) are brothers, but I don’t believe your Josiah is. There are a few people online who list the three as brothers, but when you look at other info., it doesn’t seem as plausible. Please remind me where your Josiah was born in 1814. “Our” Josiah (who we believe is James and Jesse’s father) was born in about 1754 (I don’t have my notes with me), and the internet has that he died in 1814 in Sangamon County, Illlinois. Thank you, M. Chadwick, for your comment. 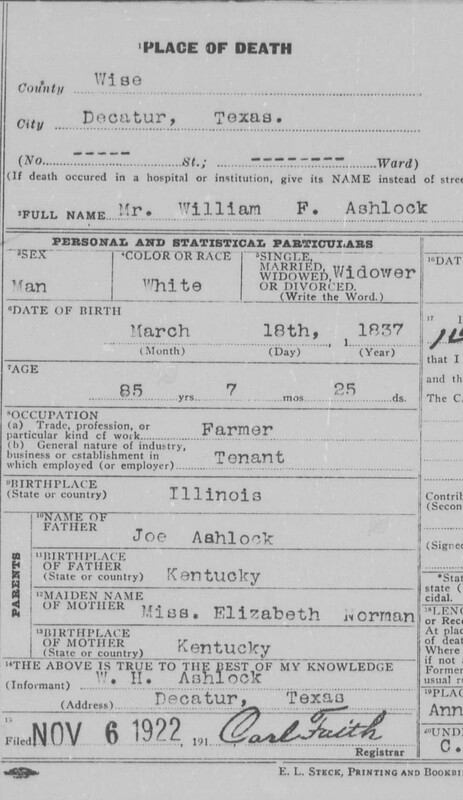 I’m afraid I may have added to the Ashlock family confusion by stating our example Josiah Ashlock’s birth date as 1814 when in fact we believe he was born in Anderson County, TN in 1807. 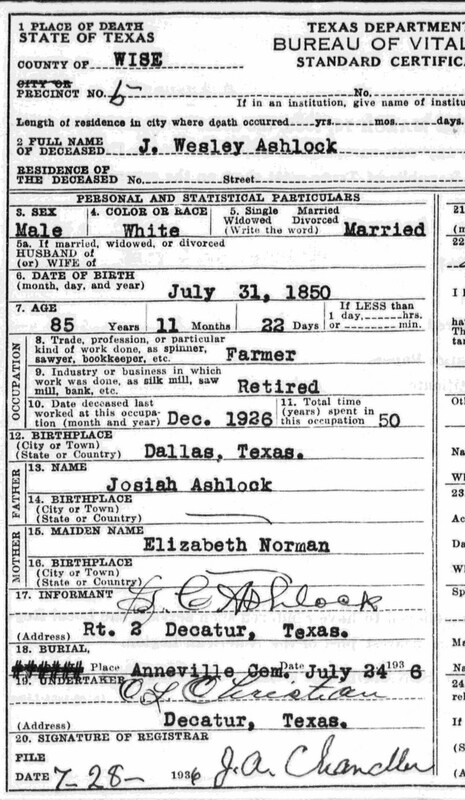 The family I’m referring to was Josiah and Elizabeth Norman Ashlock’s family in 1850 Denton County, Texas Federal Census taken in November of that year. The census taker records them as Ashlots but we know this is the Ashlock family of the three brothers in our death certificate article. Federal Census for Denton County, Texas recorded on the 6th day of November 1850. Their Peters Colony land grant was on the Denton and Dallas County line. After Josiah’s death prior to 1852, his widow Elizabeth Norman Ashlock marries Stephen Riggs. Their family appears in the 1860 Denton County Federal Census as the Stephen Biggs rather than Riggs family. Here is the Josiah Ashlock family snapshot for 1850. Elizabeth Ashlot 35 F Ala.
Nancy C. Ashlot 16 F Ill.
William F. Ashlot 13 M Ill.
Mary E. Ashlot 9 F Ill.
Sarah J. Ashlot 7 F Ill.
John C. Ashlot 6 M Ill. There is also a Josiah Ashlock family recorded in the Federal Census for Macoupin County, IL on the 8th day of October 1850. While these two families have obviously both lived in Illinois at the same time, one is now living in Texas. They are also obviously not the same family though they share several primary and secondary names. Are they related and if so, how? I do not know the name of either Josiah’s father. Could either one of their fathers have been your Josiah born in about 1754. Would he have a child born in 1807 or 1814 in Tennessee as were these two different Josiah’s? We don’t believe that “my” Josiah is the father of either of these men. However they are clearly related. There were 5 Ashlock brothers born in the mid 1750’s). Four of the brothers fought in the Revolutionary War. My Josiah was the youngest of the sons and I have not been able to find evidence that he fought or served. His father, William, did however. So my goal is to show that James M. Ashlock, b. 1808 in Rutherford County, NC is the son of This Josiah. Because so many of the courthouses burned in the civil war, there isn’t a lot of evidence. The two Josiah’s you referenced likely are either children or grandchildren of the other brothers. One of the brothers, Richard, I think, was killed in the War, but the others survived. They lived in the area of NC, TN, SC, VA. They moved to IL, Missouri and Texas. Thanks for the clues. They’ll help when (if) I get ready to pursue the father of this Texas Josiah. My only relationship with the Ashlocks is because my 2 x great grandfather married the widow Ashlock. I have met a couple of wonderful Ashlock kin in the Wise County area of Texas. I’m also aware of and have an aunt (Byrd) who married into the Ashlocks in Collin County, TX in the 1860s. They also came to Texas from Illinois. Next PostNext What Do You See In this 1860 Census Image?